Welcome to TAY Board Game Night! Each week I hope to bring you a new board game to try out, throw in a mini blurb about why you should play this game, and then add some alternate playstyles or challenges for you to try while you play. 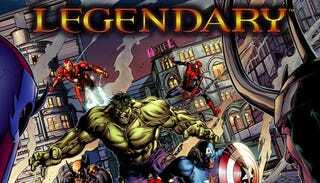 This week is Marvel Legendary! Do you have a special heart in your place for Marvel superheroes? Do you enjoy board games where you have a ton of replay value built into the game? Can you work with others while simultaneously jockeying for points and glory? Then Legendary might just be the board (card) game made for you! Legendary’s premise is very simple, you’re going to recruit a team of superheroes and then use them to defeat villains, and hopefully stop the mastermind villain from playing out his evil scheme, to win the game. At the end of the game, you’ll tally up some victory points to determine which player individually wins, but it’ll take a bit of teamwork to even get there! We won’t be throwing out any alternate modes or challenges this week because one of the best parts about Legendary is the amount of variety that comes in the box. There are several Mastermind Villains to beat, from Red Skull to Magneto, and additionally several schemes that they can choose to enact . Add in the fact that there are several groups of flunkies that they can command, and you can see how the combinations start growing! Again, how you set it up is up to you. You can randomize it, pick some combination you’ve never fought before, or go for something thematic! There are a few expansions out for Legendary that vary in size and scope, including Legendary Villains, where you get to reverse the roles and play as the bad guys! In addition there are some alternate universes, like Aliens and Predator. While these versions aren’t explicitly compatable, you can probably easily house rule them together (Aliens and Predator actually do somewhat work together!). As always, let me know in the comments how you’re building your Legendary game and how much you enjoy it!